Obligatory comment about how it's already the 15th + I can't believe we're halfway to November because I am not ready for November. I'm also not mentally prepared to deal with the fact that I haven't been in sports in a full time capacity for a year, that's a really hard thing for me to deal with. So let's go back to the fun stuff! I'm genuinely surprised that so many people during the #Blogtober14 prompts say they really don't like Halloween. I didn't realize it was a holiday people didn't care for, maybe it's because I'm always up for candy + theme parties though. Plus, Hocus Pocus. I took the BuzzFeed "Which Gilmore Girls Character Are You" quiz, because I always thought I was Rory [I even got her haircut!] but according to all of BuzzFeed's wisdom, I'm actually Lorelai. The more I think about it, the more that's probably true. I am hilarious, addicted to coffee, and capable of talking to a wall.. The closer I get to my European adventure [it's in 73 days ohmygod] the more worried I'm getting that once I go I'll never want to come back. I read all of these fun blogs about expats and it makes me want to pick up and move. To Ireland or Australia or Germany or anywhere that would have me. 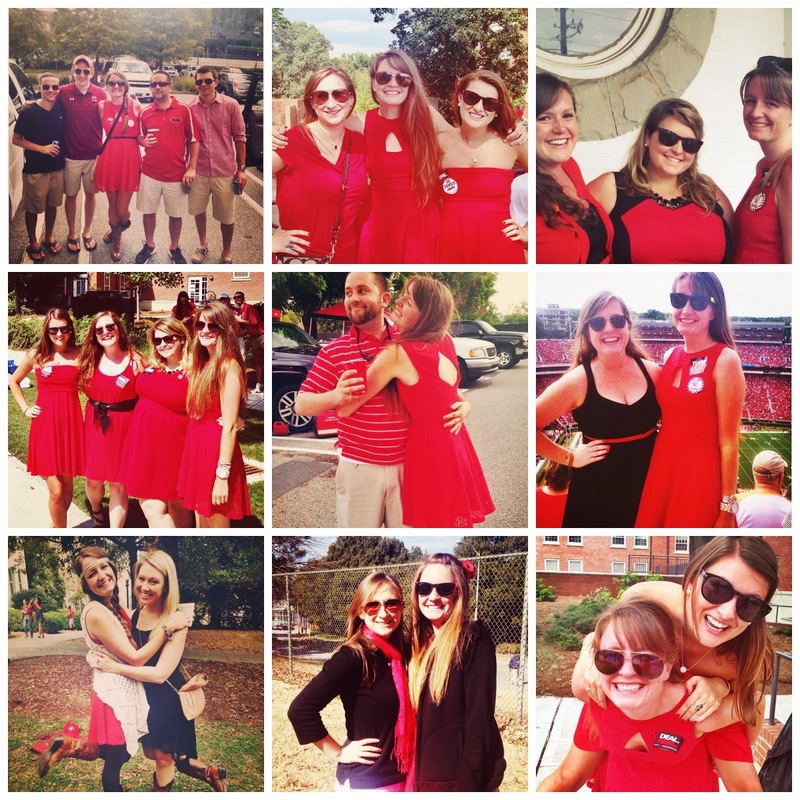 With the 34-0 win over Mizzou this weekend, I've come to the realization that I can never wear a different dress. The one game this year I didn't wear the dress? We lost. So far the dress is 8-0 EIGHT. In related news, I've worn that dress to/for eight games. I've definitely gotten my $35 out of it. I realized that I might have to get married in it + also requested that if I died during Saturday's game, that I be buried in it. good thing it's a cute dress. That's all I have to confess today, make sure you head over to Kat's place to see what everyone else is confessing! What do you have to confess this week? I always tell my husband that if I go to Europe I'm never coming back. one of my cousins went to Austrailia for study aborad. He was supposed to be there 8 months I think. He's been there 8 years, aaan has a girlfriend, aaaand I'm basically never seeing my cousin again. So yeah, it happens. Also, your dress IS super cute and clearly lucky! Go Dawgs! Ha I had to pause to take the quiz. I'm Paris. I'm so jealous you're going to Europe!! I actually looked into getting a masters degree in Australia. I'm seriously considering it! Then I could be an expat blogger! You know, I got that dress last year on my way to the South Carolina game because I realized I forgot to pack on one halfway to Athens, I stopped at the mall + it was a brand that particular Belk didn't carry, it had just been returned there, so not only was it on super clearance, but it was also the only one + it fit perfectly. hashtag fate. I'm so excited I could just die. I did the whole EF College Break thing, so I've been making monthly payments since like, March, I'm also going to be one of the oldest people on the trip.. I don't understand people that don't like Halloween. It is my absolute favorite holiday. it's such a fun one! I don't get it either.. I actually tried to move after I came back from my first trip and even though I'm not planning it now, If the opportunity came up I would go without a second thought..
oh, especially with where my life is at right now, I wouldn't give moving a second thought either! !